Secretary of State says the PA has changed its policy of paying families of convicted terrorists following pressure from Washington. 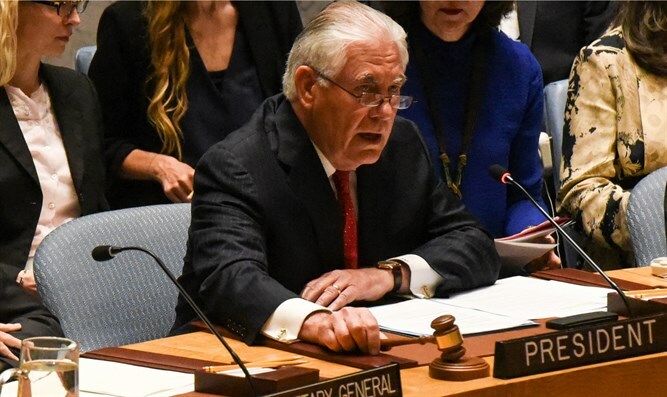 The Palestinian Authority (PA) has changed its policy of paying families of convicted terrorists, and intends to stop supporting them as a result of pressure from the Trump administration, U.S. Secretary of State Rex Tillerson said on Tuesday. Tillerson's comments came during a public hearing in the Senate on the State Department's budget. He was quoted in a report in Haaretz. Replying to a question from Senator Jim Risch (R-ID) on these payments, Tillerson said that the issue "was discussed directly with President Abbas when he made his visit to Washington." White House spokesman Sean Spicer told reporters after Trump's meeting with Abbas last month that the president had brought up the issue of the PA’s paying salaries to terrorists and their families. Leading Republican senators have written to Trump, urging him to demand that Abbas end his practice of paying terrorists and their families for attacks committed against Israel. A senior PA official recently claimed that Israel had agreed to allow the PA to pay the families of terrorists, a claim denied by the Prime Minister’s Office as a spin.